Rosa was raised in Paso Robles, CA and left in 2005 to pursue a Bachelor’s degree in Business Administration and a Master’s in Public Administration from California State University, Stanislaus. 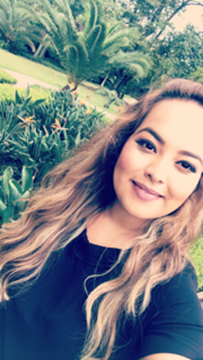 After graduating she had the opportunity to work with the California Health Collaborative as a Health Educator for the SNAP-ED and PICH programs. In this capacity she discovered her passion for education, helping others and serving the community. As a public health professional, Rosa has experience coordinating and implementing programs focusing on activity promotion, healthy eating, chronic disease management, maternity management, and tobacco cessation for adults and youth. Rosa believes that education is a fundamental piece in improving wellbeing and health. Rosa’s goal is to positively influence health behaviors by providing education, guidance, support, and motivation. The world is her playground! Rosa finds traveling to be one of the most fascinating things to do. The things that she enjoys the most about traveling are learning about new cultures, customs, foods, and finding new hiking trails. What she love the most is spending time with family and friends.